Comments " /* --- */ "
note : I used xpop menu by Reinhard Claus for the "Function" menu. 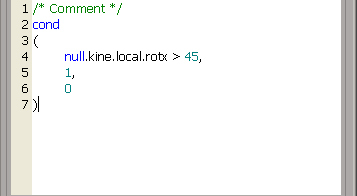 Right click on a Parameter to display his context menu, you find the command at the bottom. Open the Property Panel with the command : "Mia_ExpressionManager_Cmd();"